Victoria’s School of Dance and Rhythm is owned by Executive Director, Victoria C. Hughey, MBA who been dancing most of her life. She and and her team of instructors bring the joy of dance and the sounds of rhythm into her dance classes. We build confidence in the lives of children, teens and adults through dance, music, fun and laughter! A stimulating dance syllabus in a warm, friendly environment is provided to our students. From beginner through advanced, the students at Victoria’s School of Dance and Rhythm are challenged during their dance training and feel secure among their peers. Our goal is to provide a fun and nurturing dance program that creates an environment where children’s dreams come true! 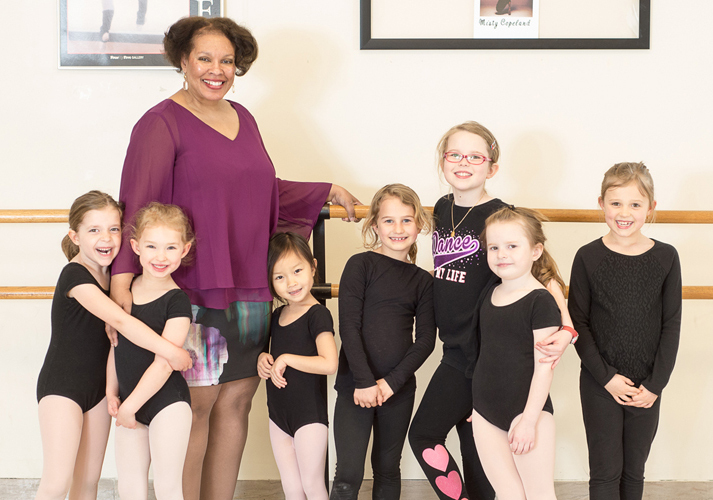 The talented staff are trained in the varying disciplines of dance and provide sound technique, creative artistry, and joy in each of their classes! Our family of instructors truly believe in the dance values that are unique to our studio and that is what makes Victoria’s School of Dance and Rhythm very special in the dance community! Creative Movement focuses on developing gross motors skills, through beginning ballet movement. We help improve these skills through creative and imaginative dance exercises, songs, and games. Children love exploring the various types of rhythms and styles. Pre-Ballet and Pre-Tap continues to focus on developing gross motors skills, through beginning ballet movement. Pre-Ballet is designed to introduce barre work and across the floor combinations and class designed to help with grace. Pre-Tap class teaches students to develop musicality, rhythm, and coordination while creating solid clarity and percussion with their feet. Children’s Ballet and Tap is an effective and elegant way of improving posture, grace, flexibility, and strength. Beginning students learn the basic positions and fundamental techniques. Tap rhythms, steps and dances increase the overall development in dance. Tap combinations become more difficult as they progress. Students will begin to learn time steps. No experience needed for the beginning level. Teen/Adult Ballet focuses on barre technique, port de bras, adagio, and allegro movements. The principals of ballet are offered in the beginning to advanced levels. Tumbling focuses on beginner’s acrobatics and artistic gymnastics on the floor. This class gives the child a well-defined space to build their motor coordination. Recommend Creative Movement, Pre-Ballet or Ballet with this class. Children’s Jazz develops strong motor skills and learn to blend movement with rhythm to put together a fun fast-paced routines. Hip Hop is a high energy class, where students will learn the fundamentals of hip hop. After warming up with isolations and stretching, using popular music, the class will then move across the floor to work on rhythm, upper body strength, and funky footwork. Recommend Jazz with this class. Teen Jazz is an upbeat class in which students will leave with enhanced motor skills, the ability to count to music, and the ability to put movement sequences together in a coordinated, fast-paced routine. Teen Tap focuses on clarity of sounds and increasing speed as well as dynamics and musicality. Students will learn time steps and are challenged through improvisational exercises, intricate rhythms and footwork. Copyright © 2019 Victoria's School of Dance and Rhythm. All Rights Reserved.